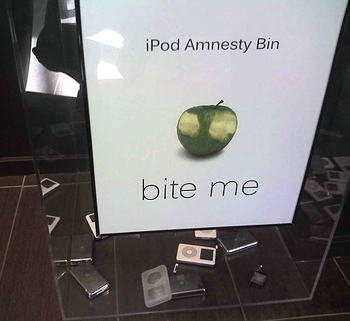 Microsoft‚Äôs Zune group headquarters now sports an iPod Amnesty Bin at the entrance to their Zune HQ into which employees are supposed to dump their iPods. The company is apparently offering amnesty to employees at Zune HQ who give up their iPods in favor of using the Zune MP3 player. Rex Sorgatz, an MSNBC.com employee, said he thought the bin was someone‚Äôs idea of a joke, nothing more. Sorgatz said he is an iPod user, but could be convinced to switch if he found a superior product.